Buy Grand Fir Tree (Abies grandis) 15 - 30cm online from UK fir tree supplier of cell grown hedges and trees. Grand Fir (Abies grandis) has been with us in Britain since the the 18th Century. Originating from the western seaboard of North America, it has been documented to be found to have reached the amazing height of 100m (333ft). A fast-growing species, Grand Fir is a commercial forestry species in Britain. Like Douglas Fir, the foliage of this tree, when crushed, has a smell of tangerines. Commonly planted in large gardens, more in the western and northern areas of Britain, it is appealing because of its attractive shape and foliage. We think that in Britain a final height of approximately 55m (183ft)is achievable. Prove us wrong! 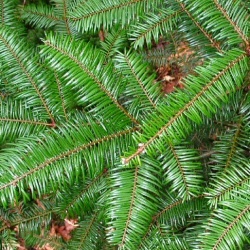 Typically, Grand Fir may be planted as an individual tree or as an avenue of trees. Estate and Policy Woodland plantings from the 18th Century often found this tree planted along with other North American conifer species. Today, 150 years later these trees form an amazing sight and we think that this tree worthy of planting to achieve the same effect for future generations.